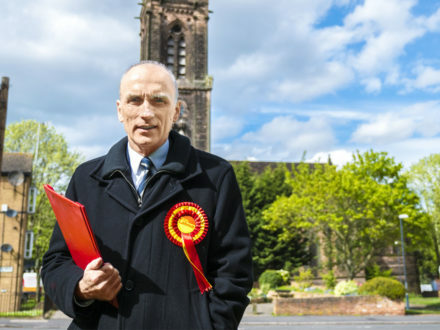 In the Derby North seat which Chris Williamson held from 2010 to 2015, the fiercely pro-Corbyn candidate has a fight on his hands. Having lost by just 41 votes two years ago, it is one of the most marginal Labour targets in Britain. Seen by many as a test case for the leader’s policy agenda, Williamson was as enthused as ever when he sat down to talk to me after a campaign rally in the rain. Why are you standing in this election and what have you got to offer the people of Derby North? “I’m a Derby lad, born and bred, I live a hundred yards from where I was born. I was the MP for five years, from 2010-2015 and prior to that I was a councillor. I’ve been active in the Labour party for 41 years now, councillor for 20 years in this city, and I’m very passionate about Derby, very passionate about Labour and I’m particularly enthused by Jeremy Corbyn’s policy agenda and the manifesto that we’re putting forward now. How would you describe your politics in one sentence? How has Brexit affected the seat? “Clearly the EU was far too much of a capitalist club, there was far too much of a presumption in favour of privatisation. But having said that, as we know, there were many benefits to being in the European Union. We managed to secure, and I was on the periphery of the campaign, to bring Toyota to Derby. “The fact is, in many working class communities across the country – and Derby’s no exception – people didn’t really see or feel the benefits of being in the European Union. They saw their jobs disappearing, Derby’s a very big manufacturing city but not as big as it used to be. Working class kids, and older people for that matter, forced into low wage, dead end, zero hour contract jobs with no real career prospects. People unable to buy a house on their own or unable to get a council house. People couldn’t see what the benefit was. “Many of the benefits that flowed to Derby and the UK we attributed to ourselves, and to a Labour government, and gave the impression that we’ve done this because of a Labour government. That’s fine up to a point but people didn’t see what the benefit was of being in the European Union. Why does Britain need a Labour government? Labour faces poor poll ratings nationally so how do you deal with that locally? Do you think Labour receives a fair hearing from the media? “No, of course we don’t – we never have. The hearing that we’re getting now is kind of non-existent. I’ve never known it so bad. “It’s an absolute scandal – the BBC have been nothing short of scandalous. “They’re doing a disservice to democracy, they’re certainly doing a disservice to the licence fee payers by not reporting accurately. I think though that we are getting some traction with the programme that we’re putting forward, because it is such a common sense proposition. When was the last moment you had to relax off the campaign trail and how did you spend it? “I suppose, trying to do the house up. We’re knocking the house around – this general election couldn’t have come at a worse time in many ways.